CHICAGO, IL, UNITED STATES, April 10, 2019 /EINPresswire.com/ -- According to a recent report on global sound reinforcement market revenue is expected to reach $9 billion by 2024 and is likely to grow at a CAGR more than 3% during the period 2018−2024. The global sound reinforcement market is witnessing a surge in demand for sound reinforcement equipment such as microphones, speakers, amplifiers, mixers, and processors due to increased adoption of sound reinforcement equipment in live music concerts, exhibitions, and trade shows. The increased use of sound reinforcement equipment in sports and tournaments, educational institutes, and corporate setups is likely to drive market growth during the forecast period. The demand from several end-user markets has grown in countries such as China, Germany, Japan, and India due to the booming commercial real estate, hospitality, corporate, and music markets as well as the shift in the consumer behavior toward live music concerts and exhibitions in developing countries. The market research report provides an in-depth market and segmental analysis of the global sound reinforcement market by product types, format types, distribution channel types, end-users, and geographies. 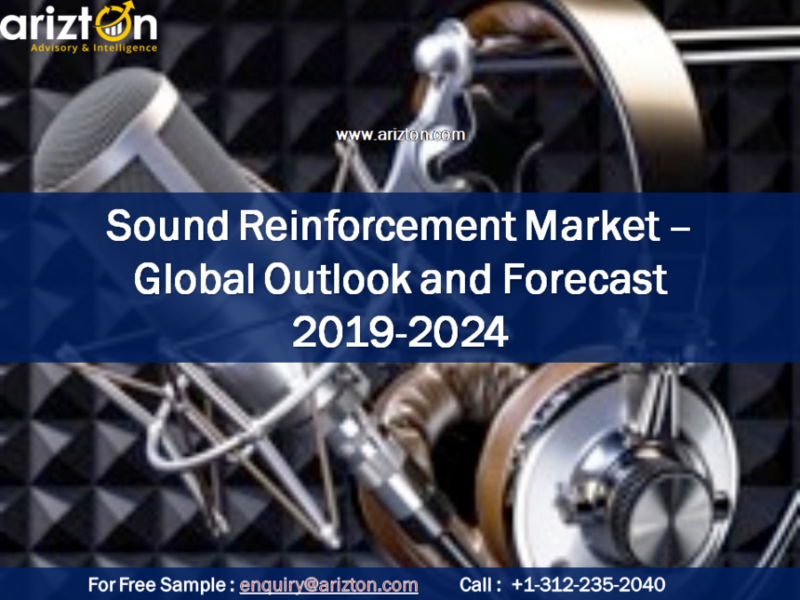 The study considers the present scenario of the global sound reinforcement market and its market dynamics for the period 2019−2024. It covers a detailed overview of several market growth enablers, restraints, and trends. The study covers both the demand and supply aspect of the market. It also profiles and analyzes leading companies and several other prominent companies operating in the market. The demand for sound reinforcement equipment was majorly concentrated in developed countries such as the US, Japan, the UK, Germany, and France. However, developing Asian countries such as India and China are witnessing increased penetration of these devices. 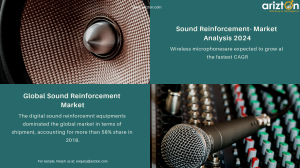 The sound reinforcement market is particularly developed and growing, with the presence of vendors such as Shure, Sennheiser, Audio-Technica, Bose, Harman, Sony, and Yamaha, offering products to a diverse range of market verticals. Futuristic inventions in the wireless digital technology and the growth in the complementary digital technologies are likely to boost investors’ confidence in the market, and the market will witness an increase in the VC funding during the forecast period. New startups are likely to come with innovative solutions with advanced features while existing vendors will continue developing their product portfolio with upgrades. Thus, the introduction of upgrades will fuel market growth during the forecast period. The global sound reinforcement market is witnessing a boost in growth due to the increased demand for audio and video equipment in government offices, institutional workplaces, and corporate houses. With an intensifying competitive market, the corporate sector and institutional workplaces are increasingly adopting equipment such as microphones and speakers to ease the working environment and smooth the flow of work activities. Further, the development of innovative tools and technologies to promote e-learning in classrooms is expected to fuel the growth of the global sound reinforcement market. Looking for more information? Order a report now! This market research report includes a detailed segmentation of the market by products types, format types, distribution channels, end-users, and geography. The sound reinforcement market by products is categorized into microphones, pro speakers, audio mixers, audio signal processors, power amplifiers, and others. The microphone segment in the global sound reinforcement market is expected to grow at a CAGR of more than 2% by 2024. Technological innovations in the microphone market are creating new opportunities for the vendors in North America and Europe along with developed economies of the APAC region. Although the market is exhibiting early signs of demand saturation and maturation, new demand for these devices is expected to come from developing economies such as China, India, and Brazil. Wireless microphones are expected to grow at the fastest CAGR than wired ones. In terms of end-users, the sound reinforcement market is segmented into corporate, large venues and events, educational institutions, government and military, studio and broadcasting, hospitality, and others. The corporate sector is expected to remain the largest end-user segment in the sound reinforcement market, contributing a major revenue chunk to the global market by 2024. The corporate segment will grow due to the growing demand for sound reinforcement and video conferencing solutions among corporates during the forecast period. The growing application of pro AV systems in the hospitality sector is propelling the demand in the market. The global sound reinforcement market by format is divided into digital and analog. The digital equipment segment dominated the global sound reinforcement market in terms of shipment, accounting for more than 58% of the total market share. The increasing number of internet users and the growing number of connected devices will drive the growth of the market segment over the next few years. The market by distribution channel is segmented into retail and online. In 2018, the retail segment contributed tothe highest market revenue globally. Although the trend of selling these products online and in OEM stores are increasing, a significant share of product distribution in the sound reinforcement market takes place through conventional pro audio and electronics stores/outlets. However, with the wide availability of the internet, high discounts, and access to consumer reviews, the online distribution segment in the global sound reinforcement market is likely to increase. The geographical segment is categorized into APAC, Europe, Latin America, MEA, and North America. The sound reinforcement market in North America is likely to grow at a CAGR of more than 3% by 2024. The US is the largest market due to the growing music industry, increasing commercial construction activities, and increasing retail expansion. In the APAC region, while Japan accounts for a major market, countries such as China and India are expected to witness increased demand due to government initiatives for digitalized economies. The growing market for music festivals and live events has also propelled market growth in the European region. Request for a free sample report! The sound reinforcement market is characterized by the presence of diversified international vendors and a few regional vendors, as international players would increase their footprint in the market, regional vendors would be finding it increasingly difficult to compete with them, especially in terms of technology and customer base. The market concentration in developed countries such as the US and other Western European countries is high, while the market is in its nascent stage in developing economies such as China and India because of the entry of several global brands in these countries. The competition among vendors exists on the basis of offerings and pricing. Vendors are using new business models and focusing on developing portfolios to drive growth. Other Prominent Vendors are ADK Microphone, Company Overview, AEB Industriale (DB Technologies), Alcons Audio, Audix, ANSR Audio, Apex Audio, Audioprof Group, Audio Engineering Associates (AEA), Beijing 797 Audio, Belden, Beyerdynamic, Blue Microphones, Bowers & Wilkins, BOYA, CAD Audio, Carlson Audio Systems, CELTO Acoustique, CODA Audio, CORDIAL, Dynaudio, D&B Audiotechnik/System, Electro‑Voice, Extron Electronics, GTD Audio, HEDD | Heinz Electrodynamic Designs, Heil Sound, Hz Sound Systems, inMusic Brands, Klipsch Audio Technologies, K-Array, Lectrosonics, Legrand, LEWITT, Liberty AV, LOUD Audio, MIPRO Electronics, MXLby Marshall Electronics, Nady Systems, OUTLINE, Pan Acoustics, Powersoft Audio, PROEL, Pyle Pro, Samson Technologies, sE Electronics, Southwire Company, Stewart Audio, Vivolink, and ZAXCOM. 1. The analysis provides market sizing and growth opportunities in the sound reinforcement market during the forecast period 2018–2024. 2. It offers comprehensive insights on current industry trends, forecast, and growth drivers in the sound reinforcement market. 3. The study provides the latest analysis of market share, growth drivers, challenges, and investment opportunities. 4. It offers a complete overview of market segments and regional outlook of the global sound reinforcement market. 5. 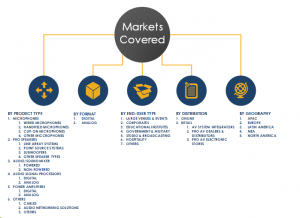 The market report provides a detailed overview of the vendor landscape, competitive analysis, and key market strategies to gain competitive advantage.